On Saturday, Tornado received three guys back from recovery and travelled to Dijon with three solid lines. The beginning of the game was pretty careful hockey. Both teams tried to avoid mistakes and the small rink in Dijon forced Tornado to adapt their game. Like usual, Tornado started to take penalties towards the end of the first period, so much so that in the last five minutes no fewer than five players were sitting on the penalty bench. Maybe because Tornado is used to it by now, penalty killing worked very well. Four minutes before the end of first period, Ossi Uotila, while playing shorthanded, showed his magic moves by deking two Dijon players and shooting the puck into the top corner of the goal. The first period ended 1-0 on the scoreboard. Second periods have been traditionally challenging for Tornado, but not this time. After 5 minutes into the second period, Tornado got a momentum and scored three goals in 2 minutes. All the goals were made by our first line and assisted by Henri Öörni. Dijon managed to score twice, but when Uotila finalized his hat-trick by scoring two more goals, the game stood 6-2 for Tornado after 40 minutes. In the third period, both teams were no longer showing their best spirit as it was clear who would win the game. A happy moment was our super rookie Niklas Meijer's first Tornado goal, 51 minutes into the game. Thierry Beran made the hardest work and Niklas had an easy job shooting the loose puck into the net. Few minutes after Vesa Hirvonen shot the puck from the blue line, it was deflected by Öörni and the final score 8-2 was sealed. After the goal, there was some rumble going on and Öörni also got a penalty because of it. Seems like our new Finish guys still have work to do adapting their physical game to French hockey as Jusse Lampsijärvi also took a roughing penalty and now needs to treat his colleagues at work for coffee because of this. Colm Cannon who scored 2+1 was chosen best player of the game and got a nice bottle of Bourgogne red wine. 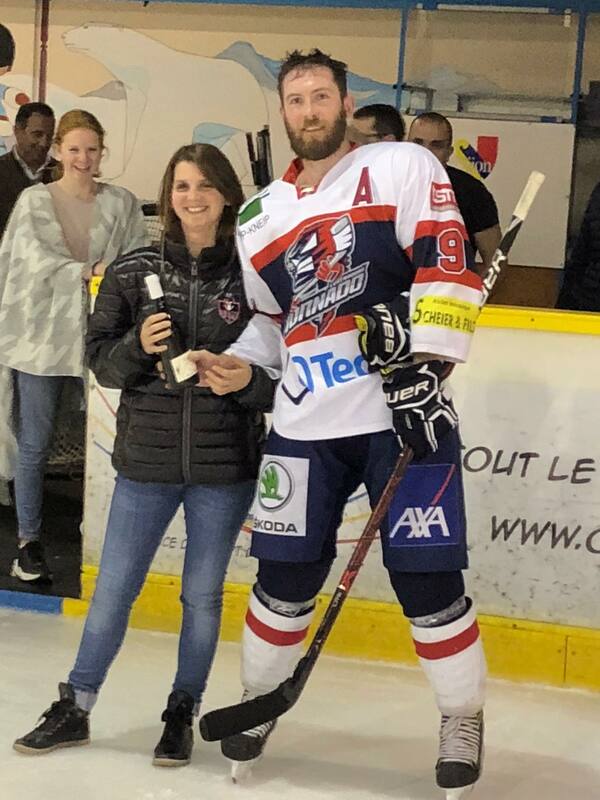 For sure it's a nice present for his beautiful wife who was enjoying “Les nuites des musées” in Luxembourg with other hockey wives while their husbands were proudly representing Luxembourg hockey in Dijon. With two successful away games, Tornado is now holding the second position in the group. Next weekend it's time to get a first home win when Dammarie will travel to Luxembourg. Dammarie is one point behind of Tornado and they have lost only one game so far against Epinal who is dominating the group. The game will be played on Saturday October 20 at 7pm. We hope to see you all there on Saturday. #bettertogether. Written by Teemu Hinkula, 14/10/2018 12:25.